Our venues are easily accessible through the public transit system of the Société de transport de Montréal (STM). You can reach the Parc des Faubourgs via the Papineau Métro station. 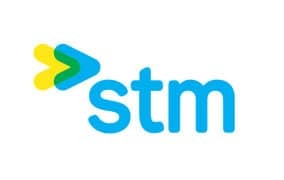 Consult the STM website for information on ticket prices, schedules and station locations. Discover a country of contrasts. By crossing Canada aboard a VIA Rail train, between the country’s major urban centres and through the countryside, you will enjoy a peaceful and comfortable journey with impeccable service and incredible vistas. Discover the diversity and open mindedness of our beautiful country. Central station is located at 895, de la Gauchetière West, at the heart of Montréal’s downtown core. It is accessible from both the Bonaventure and the McGill Métro stations. 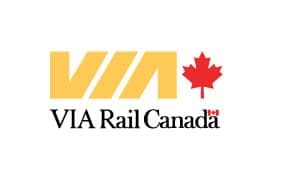 VIA Rail trains serve all of Canada. *Direct train service (Amtrak) to New York City also departs from Central station. Travelers coming to Montréal can also take advantage of Canada’s highway network. Montréal is only five hours away from Toronto or Boston and seven hours away from New York City. Montréal is located 29 miles (47 km) from the New York State border. The New York State Thruway (I-87) becomes Autoroute 15 and Interstate highway I-89 becomes Route 133 (two lanes at the border) before it reaches Autoroute 10 that leads to Montreal. From the Massachusetts I-91 expressway, both autoroutes 55 and 10 will bring you to Montréal. Visitors from Eastern or Western Canada can make their way to Montréal via TransCanada Highways 20 and 40. In Quebec, speed limits are posted in kilometers (100 km/hr is equivalent to approximately 62 miles/hr). Gas is sold by the litre (with 3 ¾ litres contained in a U.S. gallon). If you require additional information about motoring to Montréal by car, check out the Transport Québec website and select the Montréal area on the scrolling menu. You can then enlarge the map to search for the best of the various itineraries leading you to Montréal. Montréal’s Pierre-Elliott Trudeau International Airport is located 11 miles (18 km) from downtown Montréal. We suggest you take the STM’s Express Bus 747. 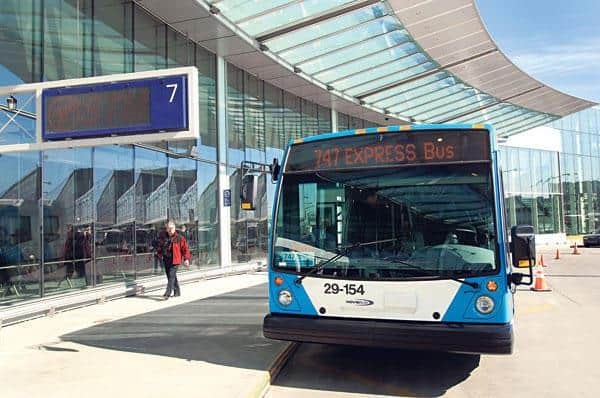 This year-round shuttle service is available 24 hours a day between the Montréal-Trudeau airport and the terminal located at the Montréal Autocar Station (Berri-UQAM Métro station), and includes nine stops along its route, both ways. Each bus has three luggage racks to handle travellers’ belongings. Depending on the traffic, a one-way trip will take between 45 and 60 minutes. Wi-Fi is available on most coaches of the 747 line. Tickets for the express service are CA $10, payable on board with exact change, using coins only, no paper bills. This rate provides the traveller with a free access pass to both the STM’s bus and metro networks, valid for 24 consecutive hours. NEW! Pay for your 747 ticket at a Stationnement de Montréal pay point. Travellers without change or a valid ticket and who wish to take the 747 line from downtown to the airport can now pay for their passage with a 747 ticket purchased at one of nine dedicated Stationnement de Montréal electronic pay kiosks. Please note that a 747 ticket acquired at these dispensers is valid for a one-way trip and must be used no later than two hours following its purchase. Express Bus 747 Schedule. You also have the option of taking a taxi that, depending on the traffic’s intensity, will cost a minimum of CA $40.